« What’s That You’re Reading? Have just one more look at that old Civil War reunion photograph. No, I still haven’t identified any more of the participants besides Daniel Davis and his brother-in-law Thomas Lovewell. The picture appears on this page only to set the stage for a story. As it happens, the very same week in July when this group of G.A.R. members sweltered in their woolen coats on Daniel Davis’s front porch at Langdon, Kansas,* sharing war stories and catching up on what had happened to their old comrades in the twenty years since General Robert E. Lee’s surrender, E. Porter Ahrens was born in Lexington, Missouri. Ahrens was nine years old in 1894 by the time his parents uprooted the family to Belleville, Kansas, in Republic County. After high school he attended a Chicago dental college, graduating in 1907. The 22-year-old doctor opened his new practice at the summit of a long, steep flight of stairs above the drug store in Scandia. He sought expert medical opinions to deal with his failing eyesight in 1917, when Dr. Ahrens was advised to quit dentistry. That explains the spectacles he was wearing when I saw him 55 years later, with lenses that struck me as resembling small fishbowls, as I reclined in his chair and waited for him to drill holes into a pair of molars in my upper jaw. If I had known that he had been considered virtually blind half a century earlier and that he would soon celebrate his 87th birthday, I might have thought of somewhere else to be that afternoon. I had a few days off from my job in Manhattan, and just before heading home to Jewell County, had noticed two tiny black spots in the deep crevices of those two molars. My mother told me about Ahrens, described him as a family friend, and assured me that even though officially retired from dentistry, he would probably be delighted to open his old office and see me. 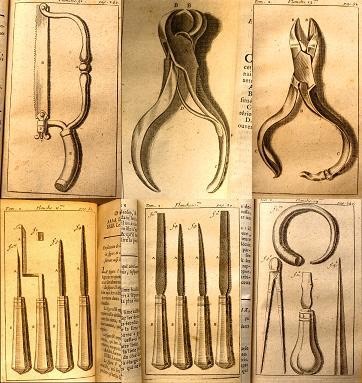 As I sat above the drug store waiting for the doctor to appear, I cast nervous glances around the tiny room, taking in the ancient and yellowed charts and diagrams, plaster models, and alarming-looking dental instruments that seemed to belong in a museum, which is where many of them reside today. I paid special attention to the vintage drill, which originally had been powered by a foot treadle, but was now strapped to an ancient-looking electric motor that was clotted with layers of oily dust. At the time, I thought the doctor was the oldest-looking man I had ever seen outside of a movie theater. Jack Crabb, the 121-year-old former frontier scout created by Dustin Hoffman and a superb makeup artist in “Little Big Man” looked older, but only slightly. Dr. Ahrens had a dowager’s hump, skin mottled by enormous liver spots, a fleshy wattle dangling beneath his chin, a comparatively tiny nose perched above an outsize upper lip, a fine head of close-cropped white hair that plunged toward his brow in a V formation, and eyes so startlingly magnified by thick lenses that at first glance, my brain drew a quick caricature of him as an intelligent frog. The doctor was also amiable, quick-witted, funny, gentle, and instantly likable. I had my doubts for a moment as his palsied hand approached my face while brandishing a whining drill bit, and I tried to calculate the distance between the roof of my mouth and my brain. However, the moment his little finger touched my cheek, the trembling stopped, his grip on the drill bit became sure, and he guided it where it needed to go. While I would like to report that the process was relatively painless, that would be a lie. Without the palliative influence of nitrous oxide or novocain, the effect of that slow-spinning drill against my molars is what I imagine a jaw would feel like with the electrodes of a car battery clamped to it. I believe I might have sold out my country, ratted out my friends, and told Dr. Ahrens where the treasure was buried, if that’s what it would have taken to make him stop. When he was finished he asked, “Did that hurt?" He mixed up a small batch of amalgam, patched the cavities he had just enlarged, charged me two dollars, and I was on my way. I learned many decades later that Dr. Ahrens gave the welcoming address at the dedication of Lovewell Reservoir in 1958. I assumed that he may have had some personal memories of Thomas Lovewell to share, but I’ve learned since then that he delivered the speech because he had long been a vigorous advocate for flood control, a need he understood after temporarily giving up dentistry to become a farmer in 1917. He testified before House and Senate committees, helped to draft legislation, and was one of four men who wielded ceremonial spades to break ground for a dam in Harlan County, Nebraska, in 1946. My adventure with his antiquated drill was not the last time I visited his office. I returned three years later to get his recommendation for an oral surgeon who would remove my wisdom teeth, just before my wife and I headed for southeast Kansas. Dr. Ahrens retired for good a year or two after that, and died two days short of his 93rd birthday. His memories live on in an oral history of Republic County, recorded in 1974 and preserved on CD at the Republic County Museum in Belleville. His dental chair and instruments are on exhibit at the Scandia Museum, a few miles west of Belleville on Highway 36. I dropped by there a few years ago to see if the grooves my fingertips must have made in the ends of the armrests are still visible. No one at the museum that day had the key to the room where the really good stuff is kept, so I still don’t know. The doctor also remains a tangible part of me, in the form of two fillings which I’m told should not have lasted nearly this long, but have nonetheless endured. It would take a major emergency to make me part with them. 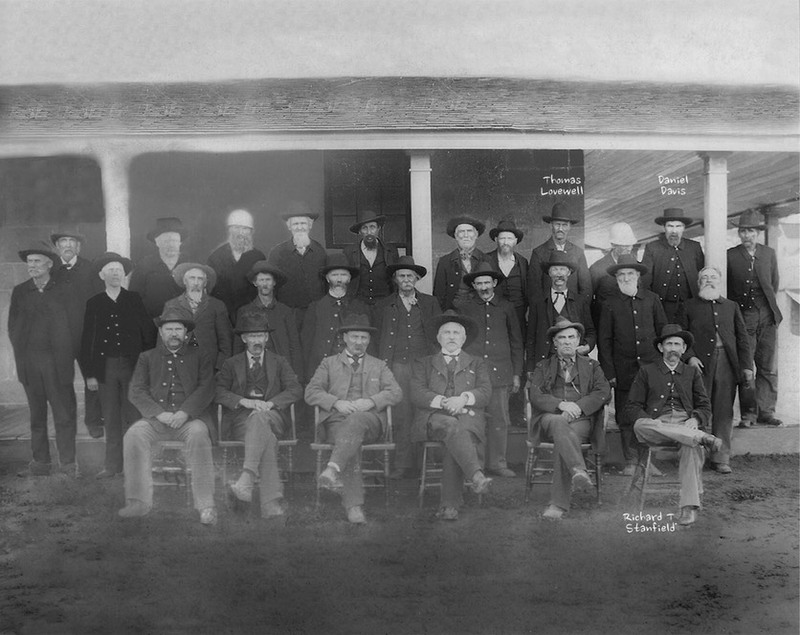 *Eight months after writing this entry, I discovered that the reunion photograph was actually taken in July 1885, but at Republic City, Kansas. There are probably enough clues to allow all the particpants to be identified.